With a final check of his instrument panel, Mississippi State aerospace engineering graduate student Zachary Doucet gently pulled back on the control stick to lift his aircraft off the ground. As the airplane sailed through the air, he spent a few minutes getting used to the controls before banking left to see how the plane would react. Chris Neal (left) points out some of the features of the Merlin SP 500-1 to Bagley instructor Calvin Walker (back) and aerospace engineering graduate student Zachary Doucet. After a few moments of flying, he circled back and prepared to land. As he approached the runway, Doucet could hear instructor Calvin Walker in his ear, coaching him through the landing. “Slowly start pitching it back,” Walker said. “Pitch back… pitch back,” he repeated. As the plane came closer to the ground, Walker’s directions became a little more urgent. “Flare, flare, flare,” he repeated quickly. The plane touched down and Doucet brought it to a stop. “You bounced the plane a few times but you’re good. You’re down,” Walker said once Doucet had returned to terra firma. Thankfully there had been no real cause for worry. Doucet isn’t a pilot and he hadn’t actually been up in the air. He had been sitting at a desk in front of a computer terminal on the Mississippi State University campus with Walker standing next to him. The entire exercise had been a virtual experience, taking place in the digital world of a new flight simulator recently installed in the aerospace engineering department of MSU’s Bagley College of Engineering. 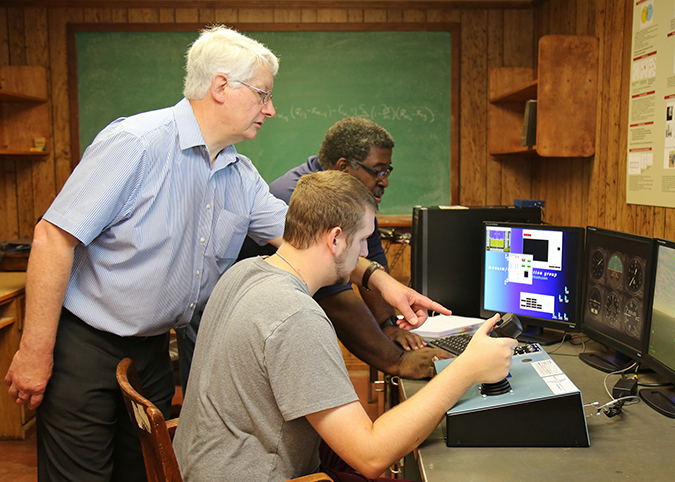 The simulator, called the Merlin MP 500-1 Academic Engineering Flight Simulator, has been installed at Mississippi State by the Sussex, England-based Merlin Flight Simulation Group. The Bagley College of Engineering is just the second organization in the United States to have use of an MP 500-1 simulator, joining the University of Dayton. But it’s not a flight simulator in the traditional sense. It’s not used to teach potential pilots how to fly. Rather its purpose is to help engineers design aircraft and help them understand how different variables affect an aircraft once it’s in the air. The Merlin MP 500-1 Academic Engineering Flight Simulator. The MP 500-1 allows Doucet and his fellow students to adjust more than 3,000 variables when testing an aircraft. Everything from wing shape and position to vehicle speed to weather conditions are configurable. The system is preconfigured with a wide range of existing aerial vehicles such as gliders, multirotor aircraft and fixed and swept-wing airplanes. The simulator can also help test transonic aircraft to mimic what happens to an aerial vehicle when it reaches speeds of Mach 2 or Mach 3. But perhaps even more impressively, the simulator also allows students to work with purely theoretical designs and aircraft that haven’t actually been created yet, as well. Walker plans to use the simulator in several classes, including Flight Test Engineering, Aircraft Design and Aircraft Flight Dynamics, where students can use it to analyze real data. And much like how auto manufacturers develop concept cars, students can use the MP 500-1 to design theoretical aircraft and see if and how they would fly in real life. “The simulator really allows students to add to their knowledge base,” Walker said. And while its primary function is to aid in aircraft design, The MP 500-1 also has applications for other disciplines beyond aerospace engineering. In addition to its classroom applications, Walker hopes the Merlin MP 500-1 has another benefit for Mississippi State – helping Bagley students recapture first place at Merlin’s aircraft design competition. In 2013, Walker led a team of Bagley students that won Merlin’s IT FLIES Aircraft Design and Handling Competition thanks to their design of an acrobatic single-engine turboprop airplane. The competition for the coming school year will be held at Dayton in April of 2018. Until then, Doucet will have plenty of time to smooth out his landings as he masters the simulator. And perhaps he and his fellow students will even use it to help create the aircraft of the future. The Bagley College of Engineering is online at bagley.msstate.edu. Follow us on Facebook, Twitter, Instagram and YouTube by searching for @msuengineering.